THIS WEBSITE HAS NOW BEEN DISCONTINUED AND DOES NOT APPEAR ON THE WEB. THE RESTORATION TRUST SUCCESSFULLY RAISED THE MONEY AND THE DAIRY HAS BEEN RESTORED. DAIRY OPENING TIMES ARE SHOWN ON THE FRIENDS OF KENWOOD SITE. The Kenwood Dairy Restoration Trust is supporting the conservation of this romantic and beautiful Dairy so that it can be shown to the public. We are working in partnership with English Heritage. The Dairy has a great Story to tell about the people who lived and worked at Kenwood. 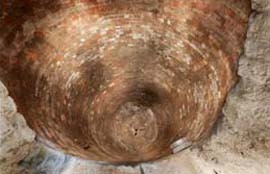 It will also show how they used the Dairy and the hidden gem beneath it, the Ice House. Between Hampstead and Highgate adjoining Hampstead Heath, to the north, part of the Iveagh Bequest, Kenwood. It is within reach of all Londoners. Many visitors to the Kenwood Estate walk past without realising what the buildings are. Have you often wondered what this curious trio of buildings is or was? Did you know that they house a stunning original Creamery and an octagonal miniature tearoom? Did you know that underneath these buildings there is a brick ice house? This is a rare survival in the London area of an ice storage pit. 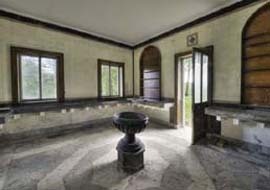 The Creamery still has its Georgian tiles and stone floor, original windows and shutters and marble sinks including a beautiful black marble basin or fountain. At the moment this cluster of small buildings is in need of conservation and repair so that it can be opened for all to see and so it can complete the Kenwood story. 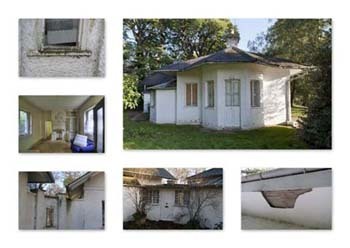 The Dairy buildings will be repaired, conserved and made accessible to the public. The creamery, ice house and the octagonal tearoom will be conserved and re-presented as historic interiors for the education and enjoyment of students of all ages. Exhibition and interpretation space will be housed in the dairy room and south rooms. 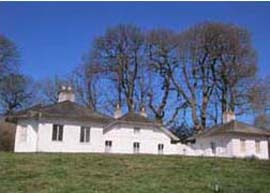 The dairy maids' cottage and south pavilion will provide a base for volunteers helping to conserve the Estate and its wildlife. The RSPB, Heath Hands and Kenwood’s own education and community volunteers will all be able to use the new facilities in the restored buildings. The Kenwood Dairy Restoration Trust is a registered charity formed to raise both the profile of Kenwood Dairy and the funds needed for its restoration. We are delighted that as part of the £5.9 million Caring for Kenwood project, English Heritage will begin restoring Kenwood Dairy in autumn 2012. It will cost £830,000 to complete the ambitious restoration work and ensure that come autumn 2013, Kenwood Dairy has a place in the London community as an educational resource, a fascinating place to visit and a volunteer hub. The Caring for Kenwood project has been made possible by a generous grant from the Heritage Lottery Fund, who have shown their commitment to the dairy as a building with incredible educational value as well as being a rare survival of our agricultural heritage in London. The dairy restoration work has also been given significant support from a private foundation, which means that as of June 2012 we are on the home straight, looking to raise the final £72,000 for the Dairy. The Dairy was once an integral part of life at Kenwood House and we believe it can again play an integral part of both a visit to Kenwood when it reopens in 2013, and in the fund-raising for Caring for Kenwood today. The more you help the Dairy, the more the Dairy can help Kenwood as a whole. We need to raise as much as we can for the Dairy. Please would you support the Dairy..
For more information or to donate you can download a leaflet. We are committed to the Dairy and Ice House Project. We want to share this iconic building with you so please take a moment to look at the pics and plans on our website and, if you are inspired to know more, spend a moment onthe Story page and look at the Gallery. This is part of English Heritage’s 'Caring for Kenwood' project.